UPDATE: I have posted an update containing several important details. UPDATE 31/08/2013: A second update including more details is available here. In recent days, the world’s attention has been focused on the alleged chemical weapons (CW) attacks in Syria. This post will seek to examine the alleged delivery system used in these attacks, and provide a preliminary analysis of the capabilities and features of such. This is a preliminary analysis only, and should be treated as such. My hope in posting this piece is that it will inform the conversation, and help cut through some of the wild guesses and outrageous claims regarding these munitions that I have seen over the past few days. Nothing in this post should be considered definitive. Additionally, I will not be attempting to establish which side employed chemical weapons, nor indeed if CW were employed at all. These are questions best answered by CW specialists on the ground (such as the UN team in Syria). 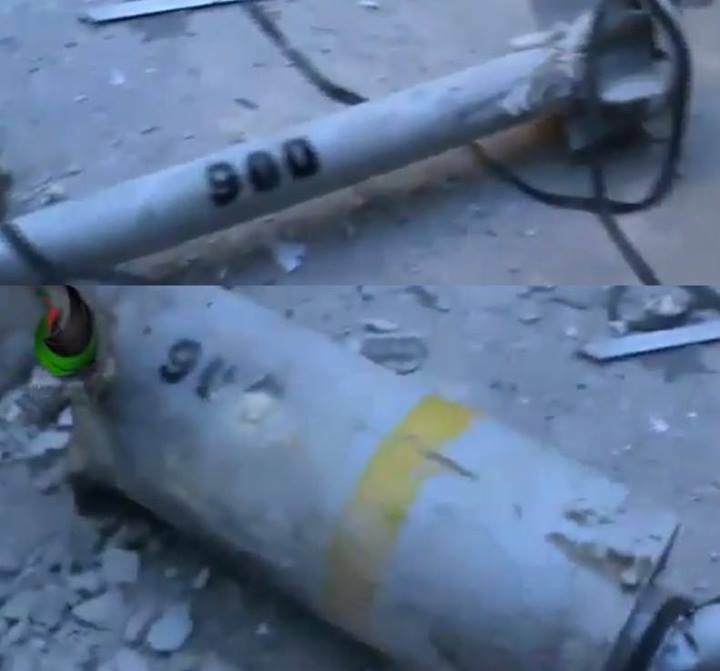 The earliest video of this munition type that I have seen is from January 2013, and the devices match with those recorded at earlier alleged CW attacks. The delivery system appears to be a non-standard surface-to-surface rocket of at least 2800mm in length (and quite possibly longer). The tail fin assembly and similarly sized warhead baseplate suggest that the rocket is of the tube-launched type, though they may be rack-launched. Estimations based on objects appearing in the images and videos alongside these munitions suggest that the warhead baseplate and fin assembly are at least 300mm in diameter, and may be as much as 350mm. The tail features a straight fin assembly with a ring aerofoil, and a single large exhaust nozzle for the rocket motor (see below). The payload section of the weapon appears to be larger than the body section, and approximately the same diameter as the warhead baseplate or central ‘collar’ seen remaining in several photos and videos. It appears to be thin walled, which would indicate the requirement for a high fill-to-weight ratio. Possible firing platforms for these would be Iranian Falaq-2 and Fajr-5, and Syrian ‘Khaibar’ launcher types. The Falaq-2, which fires a 330mm rocket, is known to be in use in Syria already. These do typically fire reasonably short (1820mm) rockets, however. Another possible launch system is the Syrian 302mm ‘Khaibar’ rocket launcher; however this system may be too narrow in diameter. The Iranian Fajr-5 type launchers fire a rocket of 333mm in diameter, and of greater length than the Falaq-2 system. Iran is thought to have supplied these to Syria, however no video evidence has been seen by this author. Of course, a bespoke launch platform could have been designed specifically for these munitions. The munitions are unlikely to be improvised devices, given their build quality and uniformity of appearance. A reddish-brown powder substance is seen around the warhead in the video below. It is possible that the two points seen on the baseplate of the warhead are filling plugs. Whilst the features of the rocket, particularly the top-heavy payload seen in the video above, are partially consistent with those of an improvised rocket-assisted munition (IRAM), the uniform build quality, numbering, and other markings (see images below) suggest that these weapons were produced on a larger scale than some of the ‘DIY’ type weapons seen in the Syrian conflict to date. If these were only produced locally in very small numbers, such a numbering system would be unlikely, and the build quality would likely be lower and less uniform. The highest number appears to be ‘900’, which may indicate that a large number of rockets have been produced. The numbering may have several alternative purposes. The fact that the majority of devices seen appear to have functioned as intended also adds weight to the theory that these are not improvised devices. One source photographed the fuze below, a Soviet/Russian ATK-EB mechanical time (MT) fuze, near the impact site of one of these munitions. 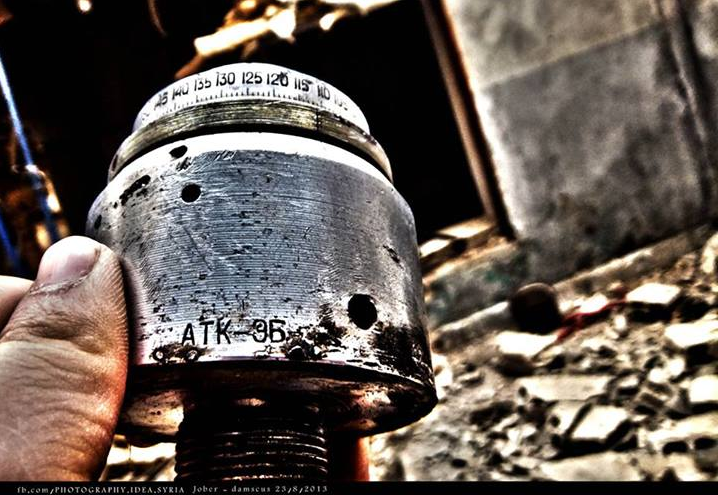 It is not known whether the fuze is from the munition in question, or from an earlier strike in the same area. It appears airstrikes were also carried out by regime forces after the alleged incident. in the Such a fuze, most commonly seen in use with RBK-type cluster munitions, could have been used to detonate these munitions. The use of a MT fuze would likely indicate that the munition was supposed to function in an airburst fashion, detonating before striking the ground. Whilst a possible candidate for this munition, a MT fuze would not necessarily be the most effective option. The use of a MT fuze, coupled with the fact that most of the devices observed appeared to have functioned, may indicate that the operating party was familiar with the weapon system and capable of effectively calculating and setting the MT fuzes to their appropriate delays. The craters and impact areas around the munitions in the various photos (see photo at top, for example) available are quite small, which probably rules out a large high explosive (HE) charge. It may still be indicative of a smaller HE bursting charge. In these images, it appears that the warhead has functioned. There exists the possibility that the munitions in question are in fact designed to deliver a HE or a fuel-air explosive (FAE) effect. FAE rockets of similar construction can be seen in the US Surface-Launched Unit, Fuel-Air Explosive (SLUFAE) and Israeli CARPET rockets. FAE or HE weapons could, with varying degrees of difficulty, be converted to deliver a liquid CW payload by replacing the payload of the munition with a chemical agent. It is possible that the munition is or was produced in two or more different variants, or that one type which was produced originally was converted to serve another purpose at a later date. The yellow band identified on some of the munitions, as seen in the image below, may be indicative of a different warhead fill type. The video below shows a powdered substance payload which looks more likely to be a HE fill. Videos such as the one below seem to indicated that the agent is either non-persistent (if a CW fill), or that the munitions have been used with non-CW fills, as discussed. Many of the images and videos show people handling or in close proximity to the remnants of these munitions. 3.) It appears to have a diameter of approximately 300mm or more at its widest points (warhead base plate and tail fin assembly), and a total length of at least 2800mm. 4.) The nature of the design means they are unlikely to be particularly long-range, nor particularly accurate. As noted in my opening paragraph, all of these findings should be treated as ‘best guesses’ only. It is not clear that these are CW munitions at all, nor are their origins known. However, they appear consistent with designs that could function with a liquid payload, and may be capable of delivering a CW agent. 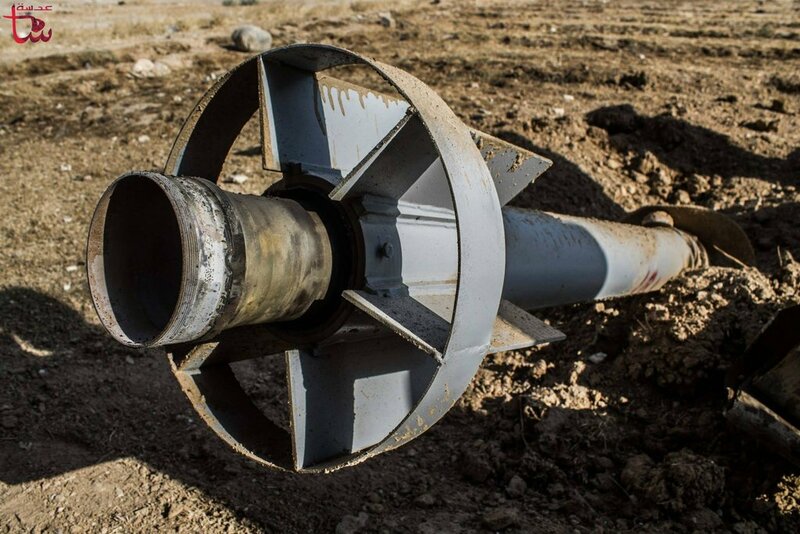 Another question worth asking: why would the Assad regime use these somewhat crude munitions when they are believed to have Scud-type missiles with chemical delivery capabilities? One specialist suggested it may be a way to develop less-expensive munitions for a surfeit of CW agents. No doubt, at least some of the facts will come to light in time, and these preliminary observations will be revised by those with access to the right data. Certainly, a lot more information is needed. UPDATE 25/08/2013 1225: Edited post to reflect reports of airstrikes after the alleged incident, a few typographic errors, and to add the location of possible filling plugs. I also clarified my point about these potentially being FAE/HE weapons, as I have received a few emails on the subject. UPDATE 29/08/2013: I have posted an update containing several important details. UPDATE 31/08/2013: New images including rudimentary measurements, and new video footage of a presumed HE device. Available here. Anyone with clearer images, qualified opinions on the device, or similar is welcome to get in touch with me. My thanks goes to Eliot Higgins, John Ismay, and several others who assisted, including a number specialising in CW and/or EOD, who have elected to remain anonymous. All photos are taken from Eliot Higgins’ compiled lists of images and video, available here and here. Thanks for your analysis. The reason why they’re not using Scuds seems quite simple to me: suspected launching sites for Wednesday’s CW attack are the 155th Brigade’s base and the Mezze military airport, both of which lie between 10 and 20km away from the targeted areas. 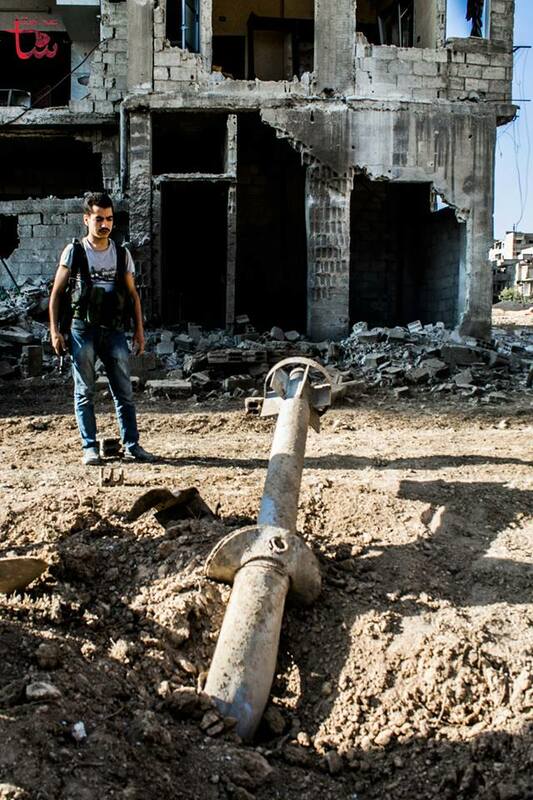 The regime’s main launching site for Scuds is thought to be in al-Qutayfa, i.e. 20km away from Eastern Ghouta. In each case, as far as I know, the required range is much below the minimal range of Scuds. The latter are therefore reserved for strikes against more remote targets in the north, and potentially abroad. Also, I suppose that the launch of a Scud is easier to detect by satellites than that of a short-range rocket like the one you described here. In short, there is NO proof of ANYTHING. No wonder, as usual with “rebels”. Of course, some people believe them, no matter how many times rebels were caught lying, and ready to explain anything, based on ….nothing really. The proof is in the putting. Thousands of victims who oppose Bashar’s Stalinist regime. SCUD launches are highly detectable, both by satellite (due to the large IR signature they generate) and possibly by radar (because of their high ballistic trajectory ballistic). They also would not necessarily be more effective than many smaller munitions spread. One possible reason for Syria developing its own CW MRL rockets might be that its CW force is largely configured as strategic, and that it had never planned to use CW in tactical operations. A sound point, Rex, and one that a few colleagues and I have been discussing. One thing I have been struck by is that while we often seen the core rocket assembly and “carrier” in videos, we don’t see any of the rest of the casing, not even embedded in nearby walls as shrapnel. As you also note, the blast crater is very small, really only consistent with a spend rocket hitting the ground. This would seem to suggest that it is indeed being used as an airburst weapon (and hence much of the rocket casing is being dispersed some distance from the point of impact). It would be interesting to know whether anyone has been finding casing elements on rooftops in the affected areas. Is an airburst type warhead the most likely option? What about aerodynamic dispersal? I know it has been fielded for persistent and/or thickened agents primarily. But couldn’t it be an effective delivery platform for a volatile liquid fill? Hence the very little (in fact, seemingly none) warhead fragmentation and a “cratering effect” that could be as well be “only” the impact force of the empty mass…. Do you exclude the possibility that these rockets used in the attack are outfitted as fuel-air explosives? Here is why I believe they were: 1) at least one video from the attack (available on the brown moses blog) shows a concrete wall that is destroy 3 stories in the sky. The narrator says the damage was caused by the rocket. He also says that the field used to be covered with plants. Elliot Higgins doesn’t believe the narrator and thinks he is lying, but why don’t we believe him? Wouldn’t that be entirely consistent with a fuel-air explosive? 2) It fits much more logically with what we would expect the Syrian regime to use while the UN chemical inspectors were in the same city; 3) an undetonated or not fully detonated fuel air explosive would spread a deadly chemical cloud just like a chemical air burst (which it is) of whatever chemical fuel is in the weapon, often ethylene oxide. It is a deadly cloud to inhale, but not near as deadly as sarin, mustard, or vw, or example, which explains the reports of these attacks have not been nearly as deadly in the past as one of have expected from a chemical warfare attack. In fact, the symptoms of the victims fit perfectly with ethylene oxide inhalation, much more so than the symptoms and effects on first responders, etc., do with sarin. Finally, Ethylene Oxide, commonly used in fuel air explosives, can be deadly if inhaled in high enough concentrations and if inhaled can cause muscle twitching, flushing, headache, diminished hearing, acidosis, vomiting, dizziness, and transient loss of consciousness. It can irritate the skin but is not deadly to the touch. It is much less deadly than sarin or other common weaponized chemical weapons. Doesn’t this fit better than retrofitting these weapons for chemical weapons use? Thoughts? Your comment is the single most sensible and logical one I’ve seen on this topic. It’s not in the least unreasonable that the army had a batch of rockets with dud fuses that were able to burst but failed to ignite the fuel cloud. Do I exclude the possibility that the rockets in the images seen were configured as FAE munitions? Not at all. As for whether your hypothesis is a ‘better fit’, I’m not sure it’s any better than several other theories I have heard. We simply don’t have enough information at this stage. Thanks for sharing your thoughts, and for the kind words. I think the answer is obvious. These are indeed thermobaric bombs. The rocked disperses a cloud of fuel, and when the rocket hits the mark, a smaller HE charge goes off at the rocket tip that then ignites the FAE, and cause the thermobaric action. So what Assad is doing is removing the fuel and replacing it with nerve agents. The nerve agents get dispersed, and the rocket still has a primary smaller explosion when hitting the target, but there is no secondary explosion of FAE, but a dispersion of a nerve toxic cloud. FAE are not designed to kill be chemical inhale. No matter how toxic the chemical, it cannot affect hundreds in a wide area. Otherwise it would be designed not to detonate at all. And why ethylene oxide, if it were not to detonate. Most likely, the fuel was replaced by nerve chemicals. Since the FAE needs to be dispersed before detonation, then instead the nerve agent is dispersed. So basically you take a standard FAE bomb and replace the duel with toxic agents. It will then operate as desired. Except that it won’t work. Sarin degrades rapidly so it is made and launched in a binary form (methylphosphonyl difluoride with isopropyl alcohol). If a smaller HE explosive would be used it would most likely ignite most of the alcohol rendering the missile and it’s contents pointless. So there is no use in exchanging the fuel in a FAE with sarin. Assume FAE with faulty fuses… Does that still count to those that will make the decision – as poison gas? In a macabre way that is a joke. If the FAE’s had detonated normally there would have been no outcry? A couple reasons it probably wasn’t an FAE. 1) The idea it killed all the plants i belied by the presence of healthy trees on the perimeter of the field. Unless it was an FAE specifically designed to kill ground cover while leaving trees intact, the bare field was probably pre-existing. 2) A dead bird is brought into the video in atleast one video. It is not singed. If an FAE had gone off it would have been. If it didn’t go off then how did it cause the facade of the near by building to collapse. Brown Moses hasa good analysis of the impact location and the possible direction of travel that lead back to a Syrian missile unit. Following his logic and process I find it, as a geographer, a credible analysis. Here is an old US 7.2 inch rocket, that could be either HE or chem filled. Granted, it is much smaller, but this design has been in the water for some time. the depicted systems of delivery appear a bit homemade. A fact that does not disqualify the suspected application, in principle. The warhead section is thin walled, but not too voluminous due to a large diameter central stem. Surface finish and color & markings come along in a look alike fashion. There is a guide nut between back fins that may indicate rail launch. The venturi shaft of the engine has been heated somewhat irregular, corrosion on the inner surface, as seen, is irregular too. At a first glance suggesting no Perchlorate-Propellant was employed. It has to be rememered that a FAE filler is sensible to its surrounding surfaces as it may cause deterioration of components. The more so it is valid for chemical agents. Liquids require a certain expansion volume, thus rendering an unobstructed liquid payload to be a heavy burden for external ballistics of the carrier. High quality surfaces are needed. Looking at the launch video, the big missile has a warhead baseplate with a width of approx 4 x the head of the bloke preping it. Most folk have a good 20cm or so head diameter, so that puts this thing at 60-80cm diameter, twice 330mm. Given it’s 2.5 times as long as he’s tall, that’s about 4m long. I think the analysis hithertoo is underestimating this thing. It’s vastly bigger than the same/similar design we see folk picking up in the other vids. Assuming the burst charge is in a tube of the same dimensions as the motor, the thing we see launching should have a payload capacity of approx 800l. Now get speculative: let’s consider what filling the thing with liquid (normal industrial delivery) Ethylene Oxide (ExO) would do. At relative density 0.89 that’s approx 710 kg. For a chemist that’s 16,200 moles. On bursting, that expands to 388,000l before mixing with air. NIOSH have an IDLH of 800 ppm for ExO, so 1 part in 1,250 is immediately life threatening. Equally dispersed – and that’s EXACTLY what FAEs are designed to do – means we have a life threatening volume of 481,250,000 litres. Now the speculation on other pages here is that a batch of fuses could have been faulty, so dispersal would likely be less that perfect, but Syria is a hot place and the stuff is 1.5 the density of air so it’s going to self disperse over a few minutes and tend to hug the ground. Let’s now assume a 20m height to this ground burst cloud, that still gives us a lethal radius of 155m from point of impact. I suspect a lethal cloud 300m wide rolling gently through town is going to do a heck of a lot of damage. It absolutely would find the basements. I note too the Wikipedia entry specifies that ExO causes blistering and skin damage (not a nerve agent trait). The media speculation of mustard and sarin presumably is due to the skin (assumed vesicant) injuries and the twitching. I’m not saying this is what happened, but one BIG “failed” FAE could plausibly do the level of damage we’ve seen, and certainly a batch of them could. It’s only theory, but it could explain genuine intercepts of SAA coms discussing their attack on the place and having a greater effect than planned, just they wouldn’t have used chems… One final point, PLEASE can people stop referring to FAEs as thermobaric weapons. They are not! The difference is techie but profound. Except that the remnants of this large rocket has never been observed in rebel territory, and the video appears just a field trial. And ExO is non-toxic if the exposure is short term, and its greatest danger is cancer. There is an August 5 video showing the M130 type of rocket with a CW payload and a dog in spasmatic mode. All one has to do is to correspond the time of such rounds with neurotoxic attacks. The evidence for a Sarin attack by Assad is overwhelming. A Syrian rebel combatant gave me map coordinates to what he described as the base of the 155th Brigade, 4th Armoured Division. Other sources seem to agree. Drop me an email (nic@jjagencies.com) and I’ll put you in touch once I’ve verified who you are.